Starting on APRIL 1, 2019, the article submission at JVP is RE-OPENED. Thank you for your attention. Lotion Ekstrak Daun Zodia (Evodia sauveolens) Sebagai Repellent Nyamuk Aedes sp Zodia Leaf Extract Lotion (Evodia sauveolens) as Repellent Against Aedes sp. 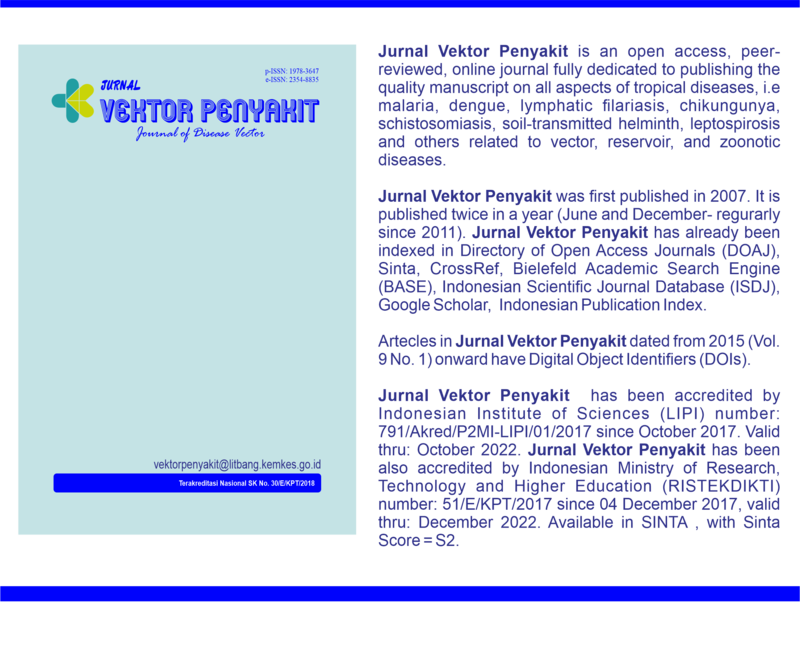 Jurnal Vektor Penyakit is an open access, peer-reviewed, online journal fully dedicated to publishing the quality manuscript on all aspects of tropical diseases, i.e malaria, dengue, lymphatic filariasis, chikungunya, schistosomiasis, soil-transmitted helminth, leptospirosis and others related to vector, reservoir, and zoonotic diseases. 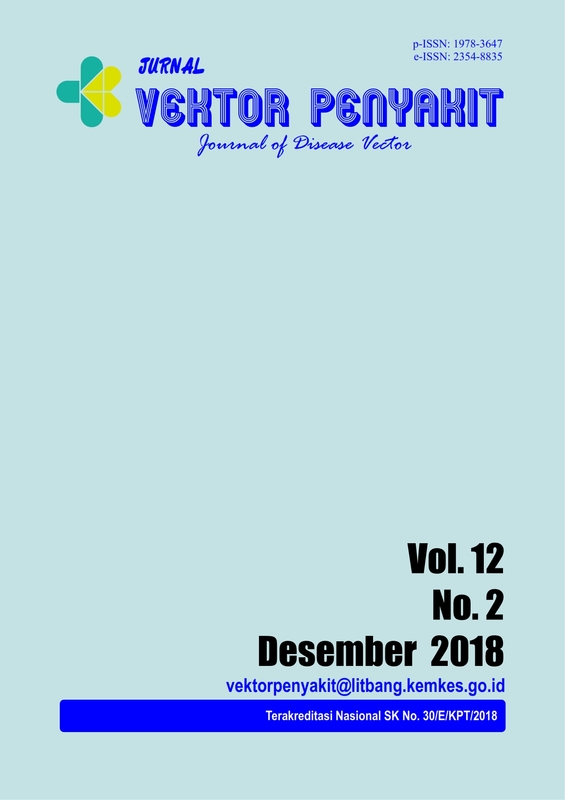 Balai Penelitian dan Pengembangan Kesehatan Donggala has published Jurnal Vektor Penyakit since 2007. It is published twice in a year (June and December). Jurnal Vektor Penyakit has been accredited by Indonesian Institute of Sciences (LIPI) number: 791/Akred/P2MI-LIPI/01/2017 since October 2017. Valid thru: October 2022. Jurnal Vektor Penyakit has been also accredited by Indonesian Ministry of Research, Technology and Higher Education (RISTEKDIKTI) number: 51/E/KPT/2017since 04 December 2017. Valid thru: December 2022. Jurnal Vektor Penyakit (p-issn: 1978-3647, e-issn: 2354-8835) is published by Balai Penelitian dan Pengembangan Kesehatan Donggala.